On application, the Standing Committee may certify that a refugee, whose claim for refugee has been accepted and who has been a refugee for five continuous years in South Africa, will remain a refugee indefinitely. Certification by the Standing Committee must be obtained prior to submitting an application for permanent residence in South Africa to the Department of Home Affairs based on Section 27(d) of the Immigration Act. Regulation 25(1) provides for the automatic review by the Standing Committee of decisions rejecting a claim for refugee as being manifestly unfounded, fraudulent or abusive. This review function is meant “to ensure that deserving applicants are not wrongfully turned away [Bula v Minister of Home Affairs]. The asylum-seeker may hand over written representations to the refugee center not later than 14 working days after receiving the rejection notice. If the Standing Committee sets aside the decision, it will send it back to the RSDO with direction for further action. Before reaching a decision, the Standing Committee may (i) invite the UNHCR representative to make oral or written representations, (ii) request the attendance of any person who is in a position to provide it with information relevant to the matter being dealt with, (iii) on its own accord make such further enquiry and investigation into the matter being dealt with as it may deem appropriate and (iv) request the applicant to appear before it and to provide such other information as it may deem necessary. In N v SCRA, the Court ruled that the RSDO and the Standing Committee have “a duty to gather evidence where necessary, and to conduct the interview in an inquisitorial manner. In [not doing so], they failed to take into account relevant considerations in determining the applicant’s claim”. The Standing Committee for Refugee Affairs may withdraw refugee status from someone “who has been recognized as a refugee erroneously on an application which contains any materially incorrect or false information, or was so recognized due to fraud, forgery, a false or misleading representation of a material or substantial nature in relation to the application or if such person ceases to qualify for refugee status” [Act, s 36]. “I would have thought that, if nothing else, a simple acknowledgement of receipt of the request coupled, perhaps, with an indication of the time which would probably be required to process the request would not have been beyond the call of common courtesy, and would certainly have been within the bounds of possibility for an organ of state” [Ruyobeza v DHA]. 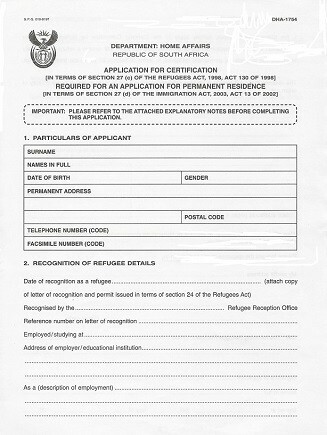 The burden of proof is on the Standing Committee and, before refugee status may be withdrawn, the Committee must provide written notice to the refugee: (a) explaining that it intends to withdraw the status; (b) identifying the reasons for the intended withdrawal; and (c) giving the refugee notice that he or she has the right to make a written submission to respond to the Standing Committee within 30 days of the date of notice. [Reg, s 17]. If the refugee fails to respond within this period of time or the response fails to overcome the reasons provided for the withdrawal, the refugee status may be withdrawn and the individual may be treated as a prohibited person. Asylum seekers and refugees may apply for permanent residence on another ground. In that case, they are not required to cancel their asylum seeker permits (section 22) or to relinquish their refugee status (section 24). In addition, possession of a valid passport is not a prerequisite for the issuance of a permanent residence permit to asylum seekers or refugees. The Standing Committee for Refugee Affairs’ decisions may be reviewed by the High Court of South Africa on the ground, for instance, that the Committee failed to take up-to-date and relevant information on the situation prevailing in the country of origin and on the applicant’s personal situation or did not correctly applied its mind to the application.